Welcome! Welcome to Franklin County and the coastal communities of Alligator Point, Apalachicola, Carrabelle, Eastpoint and St. George Island. Cover photo by Maggie Fuller Photography. In Franklin County youâ&#x20AC;&#x2122;ll find a unique coastal culture with a fascinating history and the freshest seafood on the Gulf Coast! Alligator Point Sea oat-covered sand dunes, marsh habitats and easy accessibility make Alligator Point perfect for birding and wildlife observation. charters. There are several public access areas along the beach and two boat ramps on the bay side. A unique feature to Alligator Point is the Bald Point State Park, a naturally preserved state park. The convergence of Ochlockonee Bay and Apalachee Bay produces diverse habitats and makes it an excellent vantage point for fall and spring migrations of birds and butterflies. The 50,000 acre State Park is also an outstanding observation point for year-round wildlife residents such as black bear, white-tailed deer, coyotes, bobcats and hosts of resident birds. The day-use facilities at the park include picnic pavilions, restrooms and a fishing dock. point of interest Wander the woods in the easternmost end of Franklin County and you may find an interesting chatterbox in the trees. Rare white squirrels make their home in eastern Franklin County and neighboring Wakulla counties. he park features beaches, bicycling, birding, canoeing, fishing, hiking, kayaking, swimming and wildlife viewing. The nearby St. Marks Wildlife Refuge is also a popular visit for wildlife enthusiasts. Alligator Point’s protected bay, Alligator Harbor Aquatic Preserve, encompasses 14,366 acres and serves as a nursery for many game fish species such as grouper, snapper, cobia, tarpon, and redfish. Miles of beaches and an abundance of shallow bays, marshes and fresh water rivers provide great outdoor opportunities including deep sea and sight fishing, boating, kayaking, bird and wildlife viewing. On Alligator Point, you can enjoy uncrowded beaches, cast a rod, catch shrimp, enjoy sunsets, collect shells or just gather your thoughts. The absence of noise and glaring lights makes for prime relaxation and exquisite stargazing. Accommodations range from beachfront vacation homes to modest cottages. Many vacation rentals are pet friendly. According to experts, white squirrels are a white version of the eastern grey squirrel - a genetic anomaly due to a mutated gene. Unlike albino squirrels which have red eyes, North Florida’s white squirrels have dark eyes, generally tend have a gray patch on their heads and a “dorsal stripe” down their backs. These unique squirrels can be found throughout North America and Canada. We’re happy they call us home too! Apalachicola offers maritime history and a working waterfront with restaurants serving the freshest seafood on the coast. commodations. Looking for a treasure to take home? Spend time browsing through unique galleries, stores and antique shops. Apalachicola’s history and maritime culture are matched by the area’s bountiful natural resources. The Apalachicola River and Apalachicola Bay provide great fishing opportunities for both fresh and salt water fishing buffs. Outdoor enthusiasts can explore the endless bays and waterways by kayak, canoe, riverboat or sailboat while in Apalachicola. point of interest The seafood industry in Apalachicola is as important today as it was more than 175 years ago. Oysters were Apalachicola’s first seafood industry, sold locally as early as 1836, harvested much the same as they are today with scissor-shaped tongs hoisted aboard shallow-draft skiffs. By 1850, oysters had begun to be packed in barrels and shipped aboard steamers headed north or to other neighboring states. Apalachicola's seafood industry has most significantly shaped the culture and maritime heritage of Apalachicola and it is the seafood industry that anchors a growing nature-based tourism industry throughout the region. With a natural deep-water harbor and easy access to three rivers, Carrabelle is a salty attraction to sailors, kayakers and boaters of all ages. A renowned golf resort nearby makes this the perfect outdoor getaway. onsidered the Gateway to the Gulf for its easy access to offshore fishing and boating, Carrabelle is a naturalist’s paradise. Uncrowded, white-sand beaches are perfect for family vacations and the fishing is unsurpassed. Unpretentious and friendly, Carrabelle is the place to experience small town nostalgia. You’ll feel the pride of a patriot when you visit the Camp Gordon Johnston Museum that tells the story of how our troops trained on the salty beach of Franklin County for the D-Day Invasion of Normandy in World War II. The nearby Crooked River Lighthouse reminds you of the town’s maritime importance. point of interest There is a phone booth along thehighway in Carabelle regarded as the “World’s Smallest Police Station.” Built in 1963, it was originally a police phone box that evolved into the small town's official police station for a time. The tiny office has earned a fair amount of fame for its oddity, appearing on several television shows including “Ripley’s Believe It or Not!” Long abandoned as a functioning police station, the original structure has been replaced over the years. Today a replica of the booth is on display on U.S. Highway 98 across the street from the Carrabelle Chamber of Commerce office. People come to Carrabelle not only for fabulous fishing but also to sail, snorkel, scuba dive, scallop, play on the beaches or to just steal away from the real world for a while. Wildlife is plentiful here in Carrabelle. It is not unusual to spot a deer, fox, blue heron, pelican or even a family of black bears at play. If luck is really with you, you may be entertained by local dolphins when walking the beach or riding in a boat. 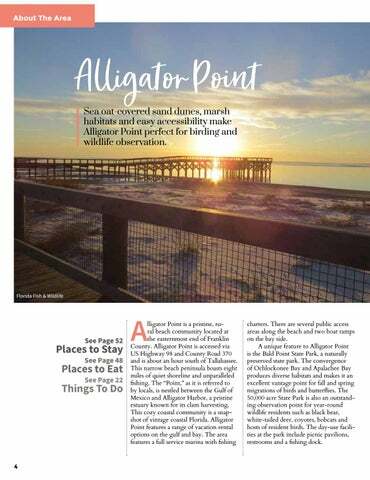 astpoint is the seafood central hub of Franklin County and probably one of North Florida’s most authentic fishing communities. Located across the bay from Apalachicola and St. George Island, Eastpoint features rustic seafood houses and weather-worn docks where oystermen haul their heavy burlap bags of freshly harvested Apalachicola Bay oysters to be washed, shucked, packed and transported across the country. Most of the county’s entire commercial oyster industry is concentrated here within about a mile along coastal Highway 98 overlooking St. George Sound and Apalachicola Bay. The nutrient-rich shallow bay system just offshore of this scenic fishing hamlet supports the lion's hare of the county’s commercial fishing industry and serves as vital habitat for much of the region’s marine life. National Forest and Tate’s Hell State Forest through scenic Highway 65 – part of the Big Bend Scenic Byway. Eastpoint is also home to the Apalachicola National Estuarine Research Reserve (ANERR) and Visitor Center. Considered one of the state’s premier research and education facilities, the ANERR facility features a visitor center complete with fish tanks, walking trails, interactive displays and ongoing public education programs and activities. unity with a uy fresh local d restaurants deep. ystermen harvest oysters in Franklin County from more than 7,000 acres of public oyster "bars" and 600 acres of private leased bars in Apalachicola Bay. Public bars are divided into "winter" bars, which are harvested from October through June and "summer" bars which are harvested from July through September. There are several hundred employed in the seafood industry in Franklin County. Oystermen harvest the oysters today in the same manner they have for a century. From small wooden boats 20-23 feet long, using tongs that look like two rakes attached scissor-style, the oystermen heft the oysters to the surface. Oysters are brought aboard and sorted on a culling board where they are separated by size. On shore the seafood houses sort the oysters and package them for sale either in bags or boxes. They are also shucked and sold in pints or gallons. point of interest Oysters may be “king” in Franklin County, but they are just one of many seafood species to thrive here. According to The Apalachicola National Estuarine Research Reserve, the Apalachicola River Basin is home to 186 species of fish, and the bay system serves as a critical nursery area for more than 95 percent of all species harvested commercially and 85 percent of all species harvested recreationally in the Gulf of Mexico, including shrimp, blue crab, stone crab and finfish. St. George Island St. George Island is the premier beach destination for those seeking natural beauty without the big crowds. the State Park at the east end. There are several businesses on the island that rent kayaks, paddleboards or even boats. You can charter a trip with experienced fishing and tour guides. There are so many family and pet-friendly things to do on St. George Island. Rent a bike or bring your own to enjoy miles of bike paths. There is a sixmile paved path that parallels Gulf Beach Drive, from just outside St. George Plantation to the entrance of St. George Island State Park on the island's eastern end. Enter the state park and you'll have the opportunity to pick up hiking trails for exploring dunes, forest, and marshes. Rent a boat or charter a trip to explore the bay and nearby islands. Go fish, rent a kayak or paddleboard, take a hike, or go bird-watching or stargazing. Walk the beach at dawn in early summer, and you may see nesting sea turtles. Stop at the visitor center and take a picture of the historic lighthouse, the Cape St. George Light. St. George Island is home to the annual Chili Charity Cookoff and SGI Paint-out event event each Spring. Each year, the music charity event Rock By the Sea Festival brings the region’s best musicians together to the island to raise money for charity. point of interest Beginning early summer, several species of sea turtles including loggerhead, green and leatherback sea turtles arrive to the beaches of Franklin County to dig their nests and lay eggs along the dune line. Sea turtles generally nest at night to avoid the sun's heat. After about two months, the hatchlings emerge at night and crawl to the gulf guided by light of the seaward horizon. Sometimes hatchlings are fooled by artificial light from beach homes. During nesting season, sea turtle volunteers canvas the beaches daily for turtle tracks, mark and protect nests with screen and monitor the incubation process. Visitors can help by turning off outdoor lights and by removing belongings from the beach each evening. Beach chairs, coolers, canopies and floats often become barriers to nesting turtles and to the hatchlings. If you love old Florida history, youâ&#x20AC;&#x2122;ll love us! ing while attempting to treat yellow fever victims. By the eve of the Civil War in 1861, Apalachicola was the sixth largest town in Florida with 1,906 residents. Around that same time, Apalachicola had a racetrack, the Mansion House, which offered balls, socials and gambling, an opera house and a newspaper. By the late 1800s, railroads had expanded throughout the U.S. carrying cargo farther and faster. As a result, the steamboats slowly disappeared from the Apalachicola River and the timber industry boomed, fueled by seemingly endless miles of rich forestland. Lumber mills were established and lumber magnates built many of the historic homes that line the town’s streets today. Late in the 19th century and on into the 20th, both Apalachicola and Carrabelle produced large quantities of lumber and turpentine. HISTORIC DISTRICT TOUR You can take a self-guided tour of Apalachicola’s historic district and learn about more than 35 private homes and public sites. APALACHICOLA MUSEUM TRAIL This self guided tour features museums, parks and historic sites. Map available at the Apalachicola Center for History, Culture and Art, the Apalachicola Visitor Center or download at HistoricApalachicola.com. CARRABELLE SNAPSHOT TOUR This self guided tour features historic landmarks, parks and local points of interest. HISTORIC LIGHTHOUSES This self-guided tour introduces you to several historic lighthouses all along Florida's Forgotten Coast. found on them, the islands resemble a crouched dog, or the early ships put their common sailors - known as dogs - on the islands before docking on the mainland so they could not jump ship. Later, the two neighbors were renamed: St. Vincent, which is a Federal wildlife refuge, and St. George Island. During the 17th century and 18th century Dog Island became a haven of piracy and smuggling. In 1838, a lighthouse was built on the western tip of the island. The first lighthouse, a 50-foot brick tower, was completed in 1839. A storm in 1842 destroyed the keeper's house and badly damaged the lighthouse tower. A 40-foot replacement wooden tower was completed in 1843 to replace the brick tower. This second tower was destroyed by a hurricane in 1851. A third 40-foot brick tower was built in 1851. Dog Island was used as a staging base by the Union army during The Civil War. During that time, Confederate forces burned the stairs in the lighthouse tower and damaged the lens to prevent the tower from being used as a lighthouse or a watchtower. The light was repaired and put back into service after the war. In 1872 beach erosion undermined the tower and caused it to fall. The lantern was salvaged and was moved to the top of the keeper's dwelling. On September 18, 1873 another hurricane destroyed the third tower and the keeper's dwelling. from Georgia. The families established a group called the Co-Workers’ Fraternity which farmed the land, harvested seafood, worked the lumber industry and shared the profits. Rebecca Wood Brown served as Eastpoint postmistress from 1898 to 1938. Eastpoint’s first post office was located in the Brown home. Descendents of the Brown family still live in Eastpoint. ST. VINCENT ISLAND St. Vincent Island was named by Franciscan friars who, around 1625, were moving westward through the Apalachee territory establishing missions. St. Vincent was part of the 1803 Forbes Purchase. In 1907 the land was sold to Dr. Valentine Mott Pierce, a patent medicine millionaire, who kept the island as a summer resort. Exotic animals were imported to the island and, for awhile, the island was run as a game preserve. Of all the exotics imported to the island only the Sambar deer remain today. In 1968 St. Vincent was purchased by the Federal Government for use as the St. Vincent Island National Wildlife Refuge. The Refuge Visitor Center is located in Apalachicola. ALLIGATOR POINT Alligator Point and Bald Point were inhabited 3,000 years before the Spanish arrived. In the mid-1800s and early 1900s, fishermen established seineyards at Bald Point. Evidence of the early turpentine industry is evidenced by pine trees that feature “cat face” scars. Bald Point was the site of military maneuvers during the WWII era. Apalachicola enjoyed a thriving sponge industry in the mid 1800s. For a time Apalachicola was the third largest sponge producing area in the state. By 1895 Apalachicola had two sponge warehouses; one of the warehouses still exists today in the downtown district. The steamboat, Crescent City, was once the only form of transportation between Apalachicola and Eastpoint. During WWII, Camp Gordon Johnston was built at Lanark Beach for use as an amphibious training camp. The Cape St. George Lighthouse and the Crooked River Lighthouse reflect the area's maritime history and commitment to preserving a unique coastal heritage. ship of the landmark just weeks before being auctioned and created a public park surrounding it. Public and private financial support enabled the restoration of the structure to be completed in 2007. Nestled in a north Florida forest habitat the lighthouse beams nightly, with its acrylic replica of its original 4th order Fresnel lens. The park picnic area features a replica of the Crooked River Lighthouse Keeper’s House which was patterned after the original 1895 plans. The Keeper’s House serves as a museum, gift shop and headquarters for the CLA. Exhibits include an historical setting of the early 1900s, examples of beacons and the methods of constructing a skeletal tower lighthouse. Everyday life objects in the Keeper’s Room include original clocks, a barometer, a glass fire grenade, pages from the keeper’s watch book, currency and much more. Visitors can look through replica Sears catalogs for a perspective on cost of living during the past century. Group educational tours are welcomed and new science-based programs are being developed. Apalachicola Bay is the lifeblood of a generations-old way of life along Florida's Forgotten Coast. The seafood culture here is unique and fragile. shrimp. Apalachicola Bay shrimpers average more than a million pounds per year, nearly 20% of the state’s shrimp supply. An active blue crab industry also exists in Apalachicola Bay, producing nearly 10 percent of the hard-shell blue crabs landed in Florida. Commercial fish species harvested in the bay include mullet, flounder and pompano. Protect the Turtles The beaches of Franklin County are important turtle nesting sites for marine turtles that migrate annually to our beaches to nest. Holes dug on the beach and furniture left overnight can disorient and trap turtle hatchlings, and can hinder the females from coming ashore to lay their eggs. Please remove your belongings and fill in any holes prior to leaving the beach. During the summer months, Franklin County’s “Leave No Trace” Ordinance is in effect for all of Franklin County, Florida beaches. Personal items such as tents, chairs, toys, umbrellas and coolers must be removed from the public beaches between 9 p.m. and 7 a.m.
ranklin County features gulf beaches with miles of gently rolling surf, bay beaches with nature and privacy, beaches that are perfect for families, beaches that are great for fishing, beaches you can drive to and beaches you'll need a boat to enjoy. Every one of our beaches is beautiful but each one is different. Safety First When swimming in the Gulf of Mexico, safety should be your top priority. Franklin County, Florida uses color-coded beach flags to keep the public aware of sea conditions. Observe flag colors at each flag location before entering water. Absence of beach flags does not assure safe waters. The 28 miles of St. George Island’s beaches are serene and pet-friendly. The island consistently rates as one of the top beaches in the U.S., with miles of uncrowded expanses for sunning and shelling, clear Gulf waters for swimming and fishing, and pristine marshes for wildlife viewing. Visitors can rent a quaint beach cottage, a multi-story luxury beach home, or lodge at one of the two island hotels or inns. Except for the Julian G. Bruce State Park beach, St. George Island beaches are pet-friendly for well-behaved and leashed pets. SGI State Park Beach St. George Island State Park beach is located at the far east end of St. George Island. Ranked as among the best in the world, this is the longest beachfront state park in Florida. There are two large beach use areas with ample parking, picnic pavilions, beach house facilities, grills and boardwalks. This beach is renowned for its soft, white sand, gentle surf and softlysloping bottom. Pull-off parking areas provide boardwalk access all along the length of the beach. Pets are not allowed on the beaches. There is an entrance fee. East End Fishing Beach This special-use area of the state park is located through a locked gate that requires a special permit and an extra fee. There is a five mile drive to the east end of the island beach parking area. The East End beach is for fishing only. This is one of the most popular fishing areas and it is as beautiful as it is productive. The deep currents that run through East Pass, which separates St. George Island from Dog Island, bring bait and bait eaters in great schools There are no facilities other than parking and pets are not allowed. CARRABELLE AREA BEACHES St. George Public Beach The public beach on St. George Island is easy to find. Coming onto the island, turn right at the stop sign and then left into convenient island parking. There are bath house facilities, covered pavilions for picnics, a playground and ball court. The Cape St. George Lighthouse and Lighthouse Keeper's House are also located nearby. This beach gently slopes and, although there are no life-guards on duty, the surf requires only normal caution. Unit Four Beach Unit Four Beach on St. George Island is on the bay side of the island at East 6th Street and an entertaining walk for nature lovers. The only facility is a picnic table and the parking is minimal. This is an outstanding venue for birding. This is a great place to walk your dog but be sure to keep your pet on a leash and pick up after them. This beach connects to some of the most productive shallowwater oyster bars and that makes for great fishing in close. The Carrabelle area features two mainland bay beach areas just west of the City of Carrabelle. Both beaches feature gentle surf protected by offshore barrier islands and both are easily accessible from U.S. Highway 98. Both beaches are close to the historic Crooked River Lighthouse and Museum. Beaches, continued from page 23 Old Carrabelle Beach This magnificent stretch of soft sand is one of the best-kept secrets in Franklin County. Access is just west of the Carrabelle Bridge on Gulf Beach Road. There is no formal parking area and no facilities. Close to acres of grass beds, this beach offers superb fishing especially in the summer and fall months. But most folks like this lovely stretch of sand for its beauty and tranquility. Dog Island is the smallest inhabited island of the chain of four Franklin County barrier islands. It is located at the eastern end of the county, just offshore from where the Crooked River merges into the Carrabelle River and then into St. George Sound. This island is small at 6.8 miles in length, accessible only by boat, ferry or airplane. The beaches here are remote and secluded. Dog Island Beach This beach requires boat access and then a hike. There are no public facilities or stores on Dog Island. If you want it, bring it with you. This is a beach for the adventurous. It takes an effort but it is a very rewarding effort. Dog Island beaches are known for the pristine white sand, good shelling, crabbing and shore fishing, and as a superior beach-picnic and recreational boating base. ALLIGATOR POINT BEACHES This narrow beach peninsula area boasts eight miles of quiet shoreline and unparalled fishing. There are two main beaches on Alligator Point and several public access areas along the beach plus two boat ramps on the bay side. Alligator Point Beach This beach is on the far east end of Franklin County. Turn off U.S. Highway 98 onto Alligator Point Road and follow it, curving around to the right. This beach is locally renowned for fishing. There are no public facilities and public access is limited with minimal parking. Bald Point State Park This state park beach is perfect for nature lovers. There is an entrance fee and there are facilities and easy parking. Because of the flow of nutrient-rich waters down the Ochlockonee River, this beach has an individual personality. Depending on flow and up-river rains, the water can look muddy but it supports a great deal of life. Shallow water oyster beds are magnets for fish and birds. Birders in particular will enjoy the range of shore birds and wading birds. Wear hard-soled footwear - there are sharp oyster shells. Bald Point offers access to two Apalachee Bay beaches for swimming, sunbathing, fishing, canoeing, kayaking and windsurfing. Facilities include a fishing dock and picnic pavilions. St. Vincent Island is a 12,300-acre undeveloped barrier island owned by the Federal Government and managed as a National Wildlife Refuge. The island is a haven for endangered wildlife. The island is accessible only by boat. The gulffront beaches here are secluded and protected. St. Vincent features a unique bayside beach that is beautiful and remote. Tahiti Beach Tahiti Beach got its name because its remarkable beauty is reminiscent of a South Seas paradise. Located on the easternmost end of St. Vincent Island, this lovely hide-a-way requires a boat for access. Due to sometimes strong currents in West Pass, this is not recommended for swimming. But the beach is perfect for shelling, sun worshiping and, for the more adventurous, a good base from which to explore more of the islandâ&#x20AC;&#x2122;s varied wildlife. • Your four-legged friend must be leashed at all times – so plan ahead! ranklin County offers some of the best beaches to bring your dog. Book a beachside cottage, and spend your days basking, while your dog runs and splashes in the surf. The area features many pet friendly accommodations and dogs who love waves will love the safe and gentle surf of the Gulf of Mexico. Franklin County requires your dog to be on a leash when you visit the beaches of Franklin County. The state park beaches on St. George Island and Alligator Point have specific rules on where your friends can visit - please check before you go. Apalachicola features a fenced-in dog park. Water Sports Several local outfitters offer boat, kayak and paddleboard rentals that you can try with your furry friend. All of them would be happy to recommend calm water locations to enjoy with your pet. Camping In addition to State forest and national forest primitive camping, there are a number of RV campgrounds in the county that welcome pets. Pet Events There are a growing number of annual pet events in Franklin County including the Mardi-Gras Pet Parade and Holiday celebration. Pet-Friendly Lodging Throughout Franklin County, we’ve got plenty of pet-friendly lodgings – whether you’re looking for a hotel, motel, inn, cottage, or bed and breakfast from Alligator Point to Apalachicola. Visit FloridasForgottenCoast.com for a list of pet-friendly accommodations. • Don’t leave a mess behind. Don’t count on the beach supplying waste bags, so bring your own and be diligent about cleaning up. • Do check the ocean for jellyfish and stingrays. A sting to your dog will be sure to ruin both his and your experience. • Dogs should be kept close to or under the table while owners are eating – and stay out of the way of restaurant staff. • Bring your own doggie bowl or ask the waiter for a paper or plastic bowl or cup for water if necessary. Pets are not permitted to eat or drink out restaurant glasses or dishes, unless they are disposable. • Dogs should remain on leash at all times. • Bring your own dog supplies – Don’t use the ice bucket as a water bowl, the towel as a pet bed, or the remote control as a chew toy. • Make sure your dog has gone potty before settling in for the night. • Check hotel policies before arriving– if there is a pet fee, be aware of it before you stay so you’re not surprised when checking out and paying. Franklin County features several important fishing tournaments throughout the year. June features the annual Fisherman’s Choice Youth Fishing Tournament. An annual family-oriented tournament geared toward helping kids develop a love for fresh and saltwater fishing. June also sees the annual Big Bend Saltwater Classic. All of the proceeds are used to develop artificial reefs in the Northeastern Gulf of Mexico. July features the annual C-Quarters Youth Fishing Tournament and during August Carrabelle hosts the annual Kingfish Shootout. Visit FloridasForgottenCoast.com for details on upcoming fishing tournaments throughout the year. St. George Island, Apalachicola, Carrabelle, Eastpoint and Alligator Point are renowned for both fresh and saltwater fishing opportunities. The unique topography of the Apalachicola River and Bay systems supports diverse marine habitat that attracts a wide variety of fish species to the area. Freshwater Fishing Franklin County is a freshwater fisherman’s paradise. Miles of freshwater creeks, sloughs and rivers flow through the North Florida wilds and empty into nutrient-rich Apalachicola Bay and surrounding waters. It’s a nature nursery here! Depending on the time of year, tide and weather, fishermen trolling the fresh and brackish backwaters here can expect to land redfish, trout, largemouth bass, bream, snook and catfish. Depending on your situation, you can fish the freshwater areas by boat, kayak or on foot – you’ll be surprised how accessible the waters are here. Beginning at the easternmost end of Franklin County, the Ochlockonee River features many freshwater fishing spots along the river banks - be sure to check out underneath the western edge of the Ochlockonee River Bridge. The Bald Point State Park is a well known fishing spot – the brackish bayside shallows are lined with a maze of oyster bars and channels that go from shallow to deep, depending on the tide. Heading west to Carrabelle, head up New River and explore the Tate’s Hell State Forest where you’ll find nearly a dozen boat ramps and kayak/canoe launches to put you close to the action. Further west, the Apalachicola River system and its distributaries, including the St.
chasing schools of shrimp. Watch for the birds, they’re a good indication of baitfish. Late fall and into winter is great for speckled trout. Redfish are often found on the beach now and often just behind breaking waves. As the water cools, they are attracted to any deeper areas or holes in the surf; tide changes are the most productive times. Hiring a guide is probably the best way to safely enjoy this high-energy saltwater fishing experience. Need some dockage, tackle, guide or advice? There are several marinas and boat rentals, fishing guides and bait and tackle shops just waiting to help. niences including a 20 slip marina, pool and screened porches overlooking the Apalachicola River. In Carrabelle, the Carrabelle Boat Club and Moorings offer waterfront accommodations. Other commercial marinas throughout the county include the Apalachicola Marina, Scipio Creek Marina and Apalachicola Boatslips. In Carrabelle, the C-Quarters Marina, Carrabelle Marina, Carrabelle River Marina and Dockside Marina are close to both freshwater and saltwater fishing from direct deepwater access. At the easternmost end of the County, the Alligator Point Marina also features dry storage. No boat? No problem! You can rent a boat from boat rental operations or charter a trip from one of dozens of experienced guides in the area. Hwy 98 Boat Ramp Highway 98 Carrabelle Riverwalk & Wharf Marine Street Timber Island Timber Island Rd. Indian Creek 93 North Bayshore Drive Patton Drive 340 Patton Dr.
Franklin County features miles of rivers, creeks and coastal shallows to explore by canoe or kayak. The Apalachicola River Paddling Trail System is actually broken into 11 separate smaller trail sections. Paddlers at all levels of ability will enjoy these 11 canoeing and kayaking trails - nearly 100 miles through the swamps of the Apalachicola River. Distances range from short, easy trips to multi-day river trips flowing into open bays of the Gulf of Mexico. Big Bend Saltwater Paddling Trail The 105-mile Big Bend Saltwater Paddling Trail is part of a much larger saltwater paddling trail called the Florida Circumnavigational Saltwater Paddling trail (CT) that stretches from the Alabama border around the tip of Florida and up to the Georgia border. Overnight camping trips along the Big Bend trail requires an FWC camping permit and the official trail is open from September 1 through June 30. The Florida Circumnavigational Saltwater Paddling trail (The CT) The premiere paddling trail in Florida is the 1550-mile, Florida Circumnavigational Saltwater Paddling Trail, or the "CT" for short. Franklin County's portion of the CT is located in sections 4 and 5, the Forgotten Coast and Crooked River. Apalachicola National Forest The Apalachicola National Forest nearly 3,000 acres of water within its boundaries. Six watersheds within the Apalachicola provide an abundance of fresh water streams, rivers, lakes, and natural springs. Remote waterways await the avid paddler looking for a multi-day journey through the Apalachicola National Forest following the winding Sopchoppy River or the remote New River. Paddlers can also explore the banks of the Apalachicola River, and use a canoe or kayak for a closer look at the major lakes in the forest, including Wright Lake, Silver Lake, and Camel Pond. Tate's Hell State Forest Tate’s Hell State Forest covers more than 200,000 acres of public land. It is bordered on the west by the Apalachicola River and on the east by the Ochlockonee River. There are 35 miles of rivers, streams and creeks available for canoeing, kayaking, boating and fishing. A concrete boat launch site is located at Cash Creek, with additional launch sites available at locations throughout the forest. Camping Camping facilities here range from luxury waterfront RV parks to primitive forest sites. hether it be primitive camping in the State or National Forest, beach camping at the Dr. Julian G. Bruce St. George Island State Park or full service RV park lodging, Franklin County offers unsurpassed beauty and wildness vista not found elsewhere in the State. There are more than 40 camping areas and campgrounds in Franklin County ranging from luxury waterfront RV parks to primitive woods sites. Many feature boat launches and nearby hiking opportunities. Most of the wilderness camping areas are located within either the Tateâ&#x20AC;&#x2122;s Hell State Forest, the Apalachicola National Forest or the Florida State Park system. One of Franklin Countyâ&#x20AC;&#x2122;s premier camping facilities is located on St. George Island at the Dr. Julian G. Bruce St. George Island State Park. The park is located at the eastern tip of St. George Island. The 2,023-acre park has several miles of undeveloped and uncrowded beaches. The Gulf of Mexico is on one side with Apalachicola Bay on the other. The campground has 60 campsites with water and electricity. Primitive camping at Gap Point is accessible only by foot, canoe or kayak by way of a 2.5-mile Gap Point Trail. There are a growing number of full service RV campgrounds in the county including the Sportsman Lodge and Coastline RV Resort in Eastpoint, Carrabelle Beach RV, Sunset Isle RV and Ho-Hum RV Park in Carrabelle. Utility hookups are available. Tate's Hell State Forest At Tate’s Hell State Forest, the High Bluff Coastal Hiking Trail winds six miles through the forest, often paralleling St. George Sound. Informative visitor education exhibits are located along the trail and cover fire, coastal scrub ecosystems and the turpentine industry. Of special note, hikers can see the natural phenomenon of the dwarf cypress trees which grow no more than 15 feet tall even though they are 150 years old. Among the most unusual plants in the forest are the native pitcher plants. Tate’s Hell also allows off-highway vehicle (OHV) use in designated areas only. OHV use requires an OHV decal that can be obtained from the state forest office. Apalachicola National Forest The Apalachicola National Forest is the largest forest in Florida with more than 570,000 acres. The forest features nearly 70 miles of hiking as part of the Florida National Scenic Trail. There you’ll see wildflowers, sinkholes, open prairies and scenic creeks and lakes. St. Vincent National Wildlife Refuge The St. Vincent National Wildlife Refuge is a 12,350-acre undeveloped barrier island, located 22 miles offshore from Apalachicola. Here, hikers can explore the island’s 14 miles of beaches and 80 miles of sand roads, often without seeing a manmade structure or even another person. Because of its relative isolation, the island is particularly popular with photographers and shell collectors. Access is by boat or ferry only. Julian G. Bruce St. George Island State Park The Dr. Julian G. Bruce St. George Island State Park boasts nine miles of undeveloped beaches and high dunes, surrounded by the Gulf of Mexico and Apalachicola Bay. Occupying nearly 2,000 acres, park terrain is a combination of sandy coves, salt marshes, shady pines and oak forest. Inside the state park, a two-mile marked trail along the bayside is especially popular among birders, and a series of trails and boardwalks throughout the park provides many wildlife sighting opportunities. Raccoons, ghost crabs and loggerhead turtles share the St. George stage with birds during different seasons of the year. Bald Point State Park At the easternmost end of the county Located on Alligator Point where Ochlockonee Bay meets Apalachee Bay is Bald Point State Park. Bald Pointâ&#x20AC;&#x2122;s coastal marshes, pine flatwoods and oak thickets foster a diversity of biological communities that make the park a popular destination for hikers. A newly constructed observation boardwalk overlooks prime areas for viewing rare Florida black bears, which occasionally swim at the beach. This area also is popular for bird watching. Franklin County are great places to look for native wildflowers. pring and fall are typically the best seasons to view the wildflowers of Florida's Forgotten Coast. However, check the wet areas in the summer for flowers such as Meadow Beauty, Hibiscus and Rosegentian. Accoording to the Florida Wildflower Foundation and most green guides in the area, State Road 65 through the Apalachicola National Forest is widely acknowledged as the best place in Florida to view native wildflowers. In general, the best areas to see wildflowers are the rural moist patches, recently burned natural fields and the infrequently mowed roadsides. Break out your binoculars and enjoy Franklin Countyâ&#x20AC;&#x2122;s birds. Here are some tips and locations to make the best of your birding experience. ranklin County offers outstanding birding opportunities year round. In the spring this is first land for the trans-gulf migrants and the different species of shore birds. Warblers and song birds are found in a dizzying array on our beaches and barrier islands. During the summer Franklin County is home to many nesting species ranging from rails in the salt marsh to osprey and eagles in the highest trees. The fall brings the migration from the north as the cool weather pushes masses of birds to the south followed by a world-renowned gathering of raptors preying on them. Winter brings many species including ducks, loons and other water birds. Whenever you're in Franklin County it's a good time to break out your binoculars and enjoy the wonderful outdoor world of birds. Here are the top spots. St. George Island State Park. Located on the east end of St. George Island. There are over 300 species listed on the St. George Island State Park birding list and there are interesting birds there at all times of the year. During the spring nesting shore birds include the American Oystercatcher and the endangered Snowy Plover. During spring, summer and fall Royal Terns, Caspian Terns, Least Terns and Forster's Terns can be observed diving in the surf. 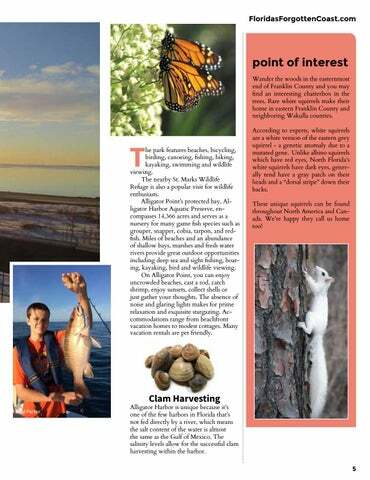 Things To Do Birding, from page 39 and the Gulf of Mexico on the east this park offers a large array of habitats: Freshwater Swamp, Freshwater Marsh/Wetlands, Pines, Lake/Pond/Impoundment, Scrub, Hardwoods/Mixed Forest, Marine/ Bay, Salt Marsh, Beach/Dune. Some of the best times are September 1 - October 15 and April1 - May 10. Spot neotropical migrants like the American Redstart, Bobolink, Black-and-white Warbler and Yellow-throated Vireo. Wintering species may include the Hooded Merganser, Bonaparte's Gull and Common Loon. Millender Site, Eastpoint. Located on St. George Sound at Patton Drive and Millender Street. This compact site offers bay, salt marsh and oak canopy habitats. Spring and fall migrants include the neotropical migrants. This spot is dependable for Indigo Bunting, Blue Grosbeak, Great-crested Flycatcher, Least Flycatcher, Yellow-rumped Warbler and Rose-breasted Grosbeak especially in the spring . Water birds, like the Redbreasted Merganser and Bufflehead, are common in the winter months. City of Apalachicola. Almost the entire City of Apalachicola is a birder's paradise. Here the old-growth pines and oaks have been preserved and it is an oasis for birds in the desert of slash pine monoculture. The waterfront, especially Scipio Creek City Marina at the north end of town, is home to a wide variety of species including the Swamp Sparrow, Fish Crow, Spotted Sandpiper, Black-crowned Night Heron, Yellow-Crowned Night Heron, Virginia Rail and Gray Kingbird. Sand Beach Road Observation Tower. Located in the Apalachicola River Wildlife and Environmental Area. Signage on Highway 65 directs you to the tower and boardwalk. Habitats include freshwater swamp, pines, hardwoods/mixed forest, marine/bay, salt marsh and mudflats. This site will offer you beautiful views as well as good birding. Along the shore line you may spot Clapper Rails, Spotted Sandpiper and Willet. Bald Eagles nest here and Osprey can be seen diving for fish from March through November. Migrating waterfowl including the Blue-winged Teal and Lesser Scaup, pass through Blountâ&#x20AC;&#x2122;s Bay. Old Carrabelle Beach. Gulf Beach Road, just west of the City of Carrabelle. This is a large, beautiful birding site favored among local birders and beach walkers. A stroll down the beach to the east leads you to an area of shallow oyster beds and fertile birding. Spring through fall is good for Black Skimmers, Ruddy Turnstones, Sanderlings, Short-billed Dowitchers and Marbled Godwits. Dwarf Cypress Boardwalk, Tate's Hell State Forest. Located about five miles north of Highway 98 on State Highway 65. Signage will direct you to the boardwalk. This is another birding site that offers a great view. Cooper's Hawks, Broad-wing Hawks and Merlin soar over the dwarf cypress forest. Spring and fall species may include Red-bellied Woodpeckers, Pileated Woodpeckers, Pine Warblers, Blackpoll Warblers, Hooded Warblers and Little Blue Herons. St. George Island & Eastpoint Fishing Piers. Located parallel to the St. George Island Bridge these old bridge terminals jut six- tenths of a mile into the Apalachicola Bay. A walk down either of these structures will put you square in the middle of the bay habitat of an extraordinary number of species. Caspian Terns, Sandwich Terns, Forster's Terns, Royal Terns, Least Terns and Gull-billed Terns nest on the old causeway between the two piers. In the waters around the piers you may spot over-wintering waterfowl including Common Loons, Red-breasted Mergansers, Buffleheads and Canvasbacks. St. Vincent National Wildlife Refuge Located off the western-most shore of Franklin County, this large barrier island is a wonderful birder's adventure, but probably best explored with a guide. There are five fresh-water lakes in the interior of the island which are best explored by kayak. A tremendous number of species can be found there including the Wood Duck, American Wigeon, Pide-billed Grebes, Northern Shoveler, Hooded Merganser and American White Pelican. Shore birds include the Blackbellied Plover, Black-necked Stilt, Least Sandpiper, and American Woodcock. The interior mixed forest may shelter Yellow Warblers, Yellow-billed Cuckoos, Northern Flickers, Carolina Wrens, nd American Goldfinch. Wading birds including the Tricolored Heron, Little Blue Heron, Great Egret, Great Blue Heron, occasionally the related Great White Heron and Reddish Egret can be observed. There are many active Bald Eagle and Osprey nests. St. James Bay Golf Resort is an 18-hole championship golf course designed in coordination with the Audobon Society blending nature and lifestyle into a unique coastal golf experience. includes a full driving range and two putting greens. Amenities include a pro shop with snack bar, golf apparel and rental clubs, as well as the Crooked River Grill restaurant. A PGA golf pro is there for professional instruction. Course-front Amenities	St. James Bay Golf Resort offers two lodging options ranging from clubhouse villas to luxury condominiums. Both golf and non-golf accommodation packages are available. Bald Point offers access to two Apalachee Bay beaches for swimming, sunbathing, fishing, canoeing, kayaking and windsurfing. Facilities include a fishing dock and picnic pavilions. Hours: Daily, 8 AM until sundown. Admission fees. Chapman Botanical Gardens 177 Fifth Street 850-653-1209 floridastateparks.org The Botanical Gardens honor Dr. Alvin Chapman. Enjoy the butterfly garden, other botanical features, walkways and open spaces. Riverfront Park Water Street Set on the Apalachicola River where fishing boats dock, this park provides the setting for many community events. Features benches, interpretatives signs and a fountain. Scipio Creek Boat Basin 479 Market Street Locally known as the Mill Pond, it is the site of a former saw mill where lumber was floated from up river and milled. It is currently a commercial fishing marina and park. the perfect backdrop for a day of exploring and relaxing. St. Vincent Island National Wildlife Refuge Visitor Center 5th Street 850-653-8808 fws.gov/saintvincent.org The St. Vincent Island National Wildlife Refuge Visitor Center features interpretive displays and information about St. Vincent Island. Lafayette Park Avenue B Established in 1832, the park was named in honor of the Marquis de Lafayette. Renovated in 1992, it is now the site of open-air concerts and weddings and has interpretive signage, picnic tables, children’s playground and fishing pier. Carrabelle Veteran’s Park St. James Avenue Located on Highway 98 in the center of Carrabelle. Come and pay your respects to the veterans of Carrabelle. Battery Park Marina Bay Avenue Battery Park is located at the foot of the John Gorrie Memorial Bridge on Bay Avenue, between 4th and 6th Streets, in downtown Apalachicola. The public park offers boat launch ramps, fishing piers and children’s playground. Seafood Landing Park 628 West Highway 98 The Franklin County Seafood Landing is located near the westerly entrance into Apalachicola on US Highway 98. This park features a concrete boat launch ramp, covered picnic tables, grills and a nature observation dock. Carrabelle Riverwalk & Wharf Marine Street The Carrabelle Riverwalk & Wharf features informational kiosks outlining Carrabelle’s waterfront history, a cement boat launch ramp, handicap accessible fishing piers, fish cleaning stations and pavilion with picnic tables. Island View Park Highway 98 A two-acre waterfront vista overlooking St. George Sound featuring interpretative signage and walkways, picnic areas. John David Patton Wildlife Park Highway 67 Amenities include nature trails, educational signage, picnic facilities and restrooms. This park offers birders and nature enthusiasts a perfect place to relax. Sands Memorial Park St. James Avenue Located on the east side of Carrabelle on Highway 98. Amenities include children’s play area, pavilion and restrooms. The Big Bend Scenic Byway is a 220mile corridor covering both forest and coastal resources of Leon, Franklin and Wakulla Counties. It is one of 150 highways across the U.S. to carry such a designation. There are 300 species of birds and more than 2,500 plant species that live in the areas adjacent to the byway. Along each of these scenic highways, you will encounter dozens of parks, wildlife areas, museums and recreational opportunities. Two sections of the Big Bend Scenic Byway wind through Franklin County – the Coastal Trail (U.S. Highway 98 along the coast) and the Forest Trail (State Road 65). Length: 23.2 miles. Begin: Franklin County at intersection of Coastal Highway (US 98) and Sopchoppy Highway (US 319). End: Franklin County at intersection of Coastal Highway (US 98) and SR 65. Length: 25.6 miles, including the spur route to St. George Island State Park. Begin: Franklin County at intersection of Coastal Highway (US 98) and SR 65. End: Franklin County at west end of Market Street in Apalachicola. Length: 25.3 miles. Begin: Franklin County at the intersection of Coastal Highway (US 98) and SR 65. End: SR 65 at the Franklin/Liberty County line at the town of Sumatra. Parks, from page 43 Tillie Miller Park 102 Northwest Avenue F Amenities include children’s play area, tennis courts, basketball courts, picnic pavilion and restrooms. Will Kendrick Sports Complex 1601 Ken Cope Avenue State-of-the-art sports facility located east of Carrabelle off Highway 98. Includes ball fields, walking trail, playground and basketball court. 108 Island Drive 850-670-7700 The ANERR Visitor Center is located off Island Drive in Eastpoint, near the bridge to St. George Island. The visitor center features exhibits on the flora and fauna of the area, giant live fish tanks, video, and a ½ scale model oyster boat. The Apalachicola National Estuarine Research Reserve Nature Center features group programs, state-of- the-art exhibits and a great collection of local cultural artifacts. The nature center is open Tuesday through Saturday from 9:00 a.m. to 4:30 p.m. eastern time. Here, you can tour exhibits that take you on a journey from deep in the river swamps along the Apalachicola River, across Apalachicola Bay, over one of the local barrier islands and out to the Gulf of Mexico. The center also contains several large aquaria that feature local fish and turtles from the fresh, brackish and salt water habitats. G. Kendrick Boardwalk offers an observation tower overlooking one of the most prolific areas, with interpretive panels and picnic tables. Indian Creek Park 93 North Bayshore Drive Indian Creek Park is located on five-acres on Indian Creek that leads to Apalachicola Bay East. Features a boat launch ramp, children’s playground and covered picnic tables. Vrooman Park 30 Sixth Street Located in the heart of Eastpoint are lighted ball fields for youth and adult baseball, softball, and tee-ball. Playground, picnic pavilion with grills, and walking track with exercise equipment. Marion Millender Park Millender Street Located on St. George Sound at Patton Drive and Millender Street adjacent to the Apalachicola National Estuarine Research Reserve. This park features lush oak canopies, covered picnic tables and grills. In 2011, Dr. Beach voted St. George Island State Park beach the #6 best beach in the nation! Nine miles of undeveloped beaches on this barrier island provide the perfect setting for nature lovers. This park offers ample recreation opportunities, including birding, fishing and swimming. The park has several picnic shelters with grills, tables and nearby restrooms. Events Franklin County is home to art exhibits, music concerts, theater performances, fishing tournaments, festivals and parades year round that highlight our natural resources, culture and history. Below are a few. Visit Floridasforgottencoast.com for a complete list of events. Franklin County is awash in art. Whether it’s theatre, music or fine art you’re sure to find something to suit your interests. rawn to the area because of its natural beauty, many artists consider Florida’s Forgotten Coast a mecca and inspiration for the creation and displaying of their art. Art galleries are tucked into the nooks and crannies within several of Apalachicola’s historic downtown warehouses. You’ll find fine art here created by nationally recognized artists, creative folk art, photography, unique sculpture and glass art. Theater buffs will appreciate the historic Dixie Theatre, a restored historic theater in the city’s downtown district. Community theater thrives here also in the form of the Panhandle Players. Apalachicola's Center for History, Culture and Art, located in an historic brick warehouse overlooking the Apalachicola River, maintains an ongoing exhibit of noted regional artists and hosts classes throughout the year in a variety of disciplines. In Carrabelle, there are a growing number of galleries tucked near the City’s riverfront district. The Rio Carrabelle Gallery also hosts seasonal pop and jazz concerts as part of an annual concert series funded through a local arts organization. Whatever your tastes, you’re sure to find some art treasure to take home! There are a number of active artist associations in the county and cultural events that run throughout the year. Visit FloridasForgottenCoast. com to learn more. With fresh seafood so readily available, visitors can experience culinary delights from more than 30 area eateries. From casual open-air cafes to upscale restaurants featuring culinary masterpieces, Franklin County’s eateries offer something for everyone. Apalachicola Chocolate Company 75 Market St. 850-653-1025 Homemade chocolates and breakfast. Apalachicola Seafood Grill 100 Market St. 850-653-9510 World’s largest fish sandwich, family-friendly. Full bar. Bay City Lodge Restaurant 1000 Bay City Rd. 850-653-9294 www.baycitylodge.com Fresh local seafood, Greek specialties. Bay Subway 47 Avenue E 850-653-1414 Sandwiches, wraps, and subs. Bite Me Deli 146 Avenue E, Apalachicola 850-653-3354 Quality deli sandwiches, salads. Boss Oyster 125 Water St. 850-653-9364 bossoyster.com Oyster specialties and fresh seafood. Café con Leché 234 Water St. 850-653-2233 Specialty coffees, sandwiches, salads and pastries. Olde Time Soda Fountain 93 Market St. 850-653-2606 Ice cream, malts, sodas & floats served in an original 1950s decor. Owl Café 15 Ave. D 850-653-9888 owlcafeflorida.com Fresh local seafood, steaks, pastas, homemade desserts, and breads. Riverview dining. The Tap Room at the Owl 75 Commerce St. 850-653-1910 owlcafeflorida.com Unique appetizers, extensive beer selection, full bar. Piggly Wiggly Grocery & Deli 130 Highway 98, Apalachicola 850-653-8768 pigglywigglyapalachicolafl.com Pink Pig 441 US Highway 98 850-653-1744 Tamara’s Tapas Bar 73 Market Street, Apalachicola 850-653-8272 www.tamarascafe.com Tamara’s Café 71 Market St. 850-653-4111 tamarascafe.com Florida flavor with South American flair. 2 Brothers on the Beach 1637 Highway 98 West, Carrabelle 850-697-4576 redweebit@hotmail.com Carrabelle IGA Grocery & Deli 812 NW Avenue A, Carrabelle 850-697-2710 Carrabelle Junction 88 Tallahassee Street, Carrabelle 850-697-9550 CJ’s Pizzeria 1615 Highway 98 , Carrabelle 850-697-1122 Crooked River Grill 151 Laughing Gull Lane 850-697-5050 stjamesbay.com Located in the St. James Bay Golf Resort. Seafood, steaks, Sunday brunch. If you love seafood you are gonna love the food festivals on Florida's Forgotten Coast. Beginning in January, the Apalachicola Oyster Cookoff celebrates the beloved bivalve. Enter your best recipe and be a contestant or just come out and enjoy a day of great food, refreshments and music. February heralds the annual Chef Sampler featuring delicacies from local restaurants. In March the St. George Island Charity Chili Cookoff is the largest chili cookoff in the Southeast. In November, the Florida Seafood Festival is the State's oldest maritime festival featuring a variety of fresh local seafood, music, headline entertainment, vendors and exhibits. Mangia 850 35 Island Drive 850-323-2584 The Point Raw Bar & Grill 379 Hwy 98 850-670-5999 Red Pirate Family Grill and Oyster Bar 236 Hwy 98 850-670-1090 redpirategrill.com Oysters, chicken & seafood baskets, sandwiches, salads. 119 Franklin Boulevard 850-927-2258 www.stgeorgeislandgrocery.com Paddy’s Raw Bar 240 East 3rd Street 850-927-2299 www.paddysrawbar.com Piggly Wiggly Express 244 Franklin Boulevard, 850-927-3960 bluepig@msn.com Sometimes It’s Hotter Seasoning Co. 112 East Gulf Beach Drive 850-927-5039 www.sometimesitshotter.com St. George Cantina 37 E Pine Avenue 850-927-2222 Subway 163 East Gulf Beach Drive, St. George Island 850-927-4781 The Beach Pit 49 West Pine Street 850-799-1020 www.thebeachpit.net The Island Sushi Company (850) 927-3022 sgisushi.com Weber’s Little Donut Shop 65 W Gorrie Dr 770-755-5452 MOBILE FOOD VENDORS There are a number of mobile food vendors on St. George Island and Eastpoint that feature fresh local seafood, donuts, snowcones and other food items. Locations vary but you're sure to notice these moveable feasts as you travel the island and coast. Franklin County boasts two breweries - the Oyster City Brewing Company in downtown historic Apalachicola and the Eastpoint Beer Company in Eastpoint. The Oyster City Brewing Company is located in the heart of Apalachicola’s historic downtown district tucked in an open-air brick corner building that once hailed as the fishing fleet tavern. Today, the brewery shares space with the tasting room, offering visitors an up-close look at how beer is made. The brewery produces three unique brews always on tap - Apalach IPA, Hooter Brown Tupelo Honey Ale, and Mill Pond Dirty Blonde Ale. Seasonal beers are produced also. The Eastpoint Beer Company is the new kid on the local brewery block and was days from launching in October 2018 when the waterfront brewery was damaged by Hurricane Michael but rebuilt soon after. The brewery features specialty craft brews. Win A Getaway! Floridaâ&#x20AC;&#x2122;s Forgotten Coast features a variety of lodging options. From quaint bed and breakfast accommodations to luxury beachfront or waterfront suites and historic inns, there is something for every budget here. The Franklin County Tourist Development Council sponsors several getaways throughout the year that could put you in an all expense-paid fantasy accommodations. Enjoy an eco-adventure weekend, a cultural getaway, a fishing excursion or a pet-friendly beachfront vacation. In addition to activities and meals, you'll stay in an area beachfront house, historic inn or boutique hotel. This is a perfect way to experience many of the county's amenities. 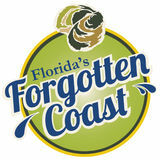 Check out FloridasForgottenCoast.com and sign up to receive activities and events information and also register online. The small coastal towns of Apalachicola and Carrabelle also boast some unique art galleries, eclectic boutiques and charming shops brimming with handmade, upscale, vintage treasures and unusual gifts not found anywhere else. here’s more to Florida’s Forgotten Coast than pristine beaches, fresh local seafood and historic landmarks. The small coastal towns of Apalachicola and Carrabelle also boast some unique art galleries, eclectic boutiques and charming shops brimming with handmade, upscale, vintage treasures and unusual gifts not found anywhere else. Apalachicola’s historic downtown features more than 20 fine art galleries, home interior shops, antique shops, clothing and gift boutiques. In Carrabelle, browse through this port town’s many unique gift and antiques shops offering collectibles, local art and unusual gifts. St. George Island features a full compliment of beach supply and sundries shops, bicycle, kayak and beach gear rental shops, beach wear boutiques, souvenir and gift shops, galleries, ice cream and specialty food stores. Eastpoint is your stop for recreational fishing supplies, bait and tackle and all things marine-related. ranklin County is the perfect place to say “I Do.” Whether it’s a picturesque beach wedding on St. George Island or Alligator Point, riverfront park wedding in Carrabelle or a traditional church wedding in one of Apalachicola’s historic chapels, there are many wedding venues from which to choose. Full-service service provider can supply everything needed from flowers, catering, photography, personal services, music and wedding rentals. Many Franklin County businesses provide wedding or special event services. Visit Floridasforgottencoast.com for a complete list. TRANSPORTATION: Northwest Florida Beaches International Airport 850-763-6751 Approximately one hour and 30 minutes, by car, from Franklin County. Tallahassee Regional Airport (TLH) 850-891-7800 Approximately one hour and thirty minutes by car to Franklin County. Apalachicola Municipal Airport (AAF) 850-653-8861 Located two miles northwest of downtown Apalachicola. Carrabelle-Thompson Airport (X13) 850-697-2727 Located three miles west of Carrabelle. St. George Plantation Owners’ Airport 850-927-2362 Located on St. George Island in the St. George Plantation development. Alligator Point, Florida: an untouched coastal paradise nestled at the easternmost corner of Franklin County. This sparsely populated, rural beach community encompasses eight miles of unspoiled coastline along a narrow beach peninsula. It’s like a vintage snapshot of old coastal Florida. Alligator Point boasts some of the most pristine beaches in Florida along with unsurpassed fishing and wildlife viewing. 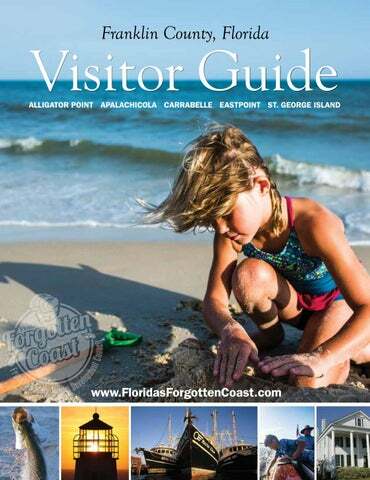 The official visitor guide for Alligator Point, Apalachicola, Carrabelle, Eastpoint and St. George Island.